Item #SDL-TS-25-5: 25 pieces of Sodalite tumbled stones. Item #CAG-TS-10-5: 10 pieces of Carnelian Agate tumbled stones. 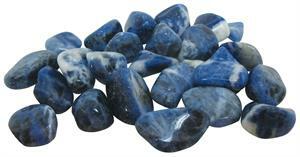 Item #DBA-TS-10-5: 10 pieces of dyed blue Agate tumbled stones. Item #DPA-TS-10-5: 10 pieces of dyed pink Agate tumbled stones. Item #HMT-TS-10-5: 10 pieces of Hematite tumbled stones. Item #RQ-TS-10-5: 10 pieces of Rose Quartz tumbled stones. Item #ATS-10: 1 lb. TW tumbled gemstone assortment (approx. forty-five pieces) including Amethyst, Green Aventurine, Blue Lace Agate, Epidote, dyed Blue Howlite, assorted Jaspers, Rose Quartz and Golden Tiger's Eye.